If you stand in Carnaby Street's Kingly Court late morning and breathe deeply, you're likely to inhale the delicious scents of spiced meats and freshly baked bread. Follow your nose to the second floor, and you'll find Le Bab, a light-filled, beautifully decorated restaurant, humming with the happy noises of busy, productive people doing what they love. 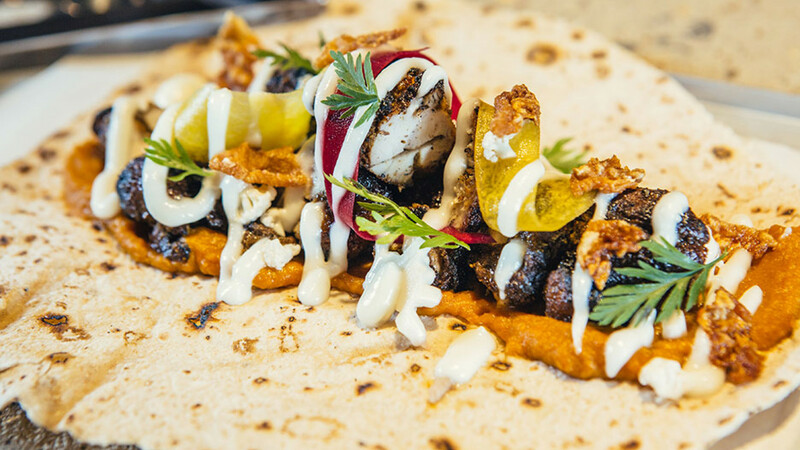 You might be surprised to learn, though, that they're cooking kebabs – albeit in a totally different guise to the sweaty doner you'd scoff at your local chippy. This, says co-owner and co-founder Stephen Tozer, is the kebab's time to shine. 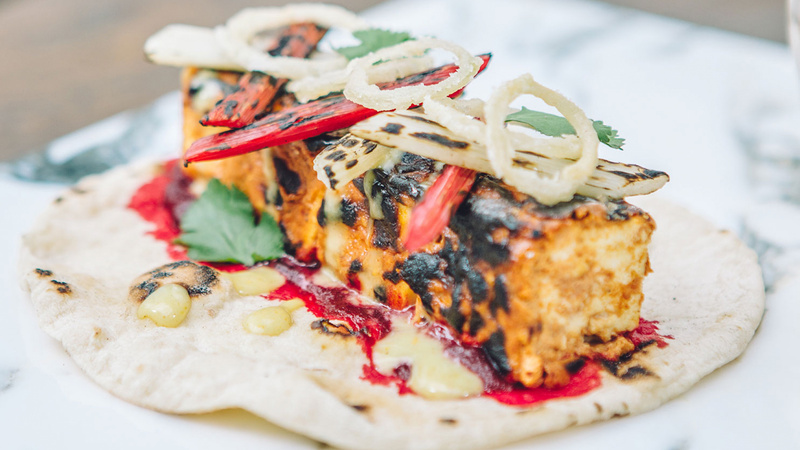 We chat to him about putting veg first, wines and the future of the kebab. A kebab is just a really amazing dish. It's like a burger – a fundamentally nice combination of things: charcoal-grilled meat; piquant, zesty, zingy salad; a dead good flatbread and some nice sauce to bring it all together. That's all a kebab is in my mind, really. And it just works. Especially now that everyone's so provenance-conscious. People don't want to have their meat flown across the world, they don't want their hens to have been reared in cages. Our menu really focuses on vegetables. At any time, they're the most changeable thing. From week to week, different things are growing and stop growing, and we take our lead entirely from that and work it into a kebab. Any dish can and should be constructed like that. It's a really convoluted answer. Ultimately we really wanted to explore kebabs gastronomically because they're something that we really love and wanted to take somewhere new. We first came up with the idea five or six years ago, because we realised that you can get really good kebabs, but no one's done anything that interesting with them. I officially quit my job to pursue this in May 2014, so it's been my full-time project for almost two years now. How did you perfect your kebab? We did a phase of street-food stuff, some pop-ups, some private events. We did loads of testing behind closed doors. Since Ed [Brunet, Le Bab's other co-owner and co-founder] left Le Gavroche and I left my previous job to actually work on this together, we've been developing the menu. 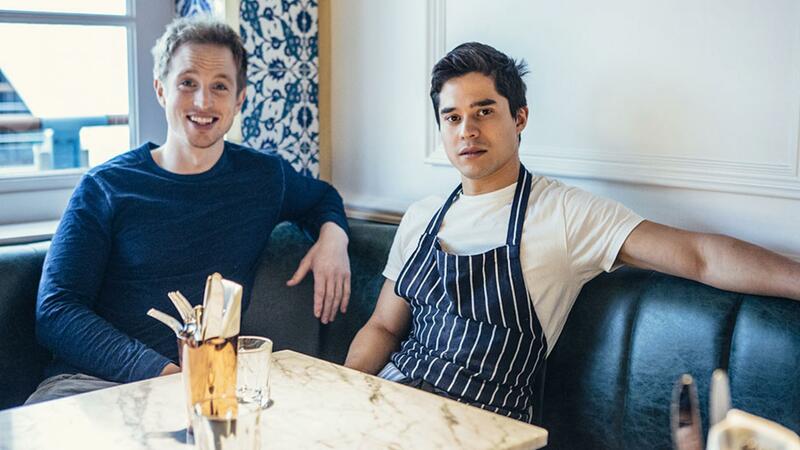 We did four months of solid, every day, six days a week, me, Manu [Canales Garces, head chef], Angus [Bell, sous chef] and Ed, we'd just make kebabs every day. And we made everything ten or 15 times before deciding to put it on the menu. And we're still really enthusiastic! The thing with kebabs is that there's so much variety. 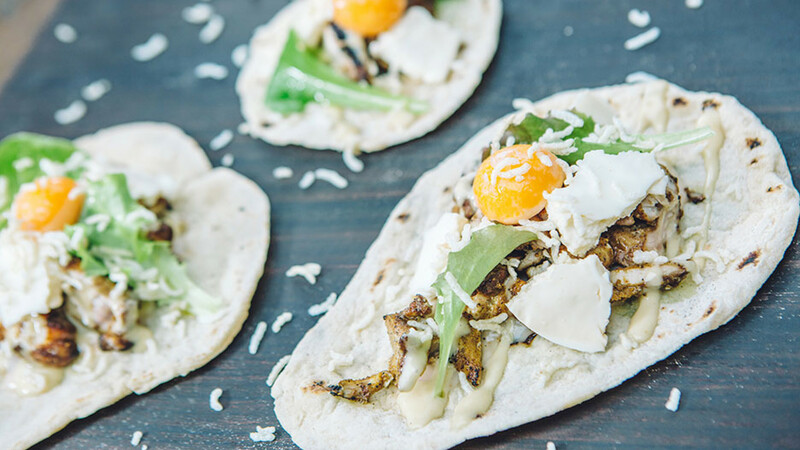 You can do anything from lobster kebabs to pork shawarmas. The only constant in these dishes is the bread. And that in itself is a really interesting, changeable thing for us. There's a lot going on, and in order to taste all of it, it's important not to smother it with big bread, although Turkish pide is absolutely gorgeous. For us, we ended up with a lavash-style bread. That's the only thing that's the same kebab to kebab, everything else is so different. Every time the season changes, all the vegetables are changing. We've also been interested in and reading about kebabs since university. Ed and I have both been to the Middle East. I spent quite a bit of time in Turkey and Ed did a kebab pilgrimage right down the Syrian border last year. Spicing styles differ from country to country, going from quite simple Turkish stuff, all the way down to South Asia, where you put loads of different spices in the mix, that's a bit more complex. When it comes to our kebabs, we're not trying to reproduce authentic kebabs, we're taking inspiration. By the time it's come out of our development process it's a really different thing. Not least because of the vegetable content. We could never go out there and purport doing proper Turkish kebabs. I'd say we're probably more Turkish-based than anywhere else with our use of herbs and spices, but really we're very pan-kebab world. We don't go microscopic on focus because we're trying to do something new. Why did you decide to go down the restaurant route rather than street food or pop-ups? We wanted to do a restaurant because the food we are aiming to produce is really tough to do properly for street food. 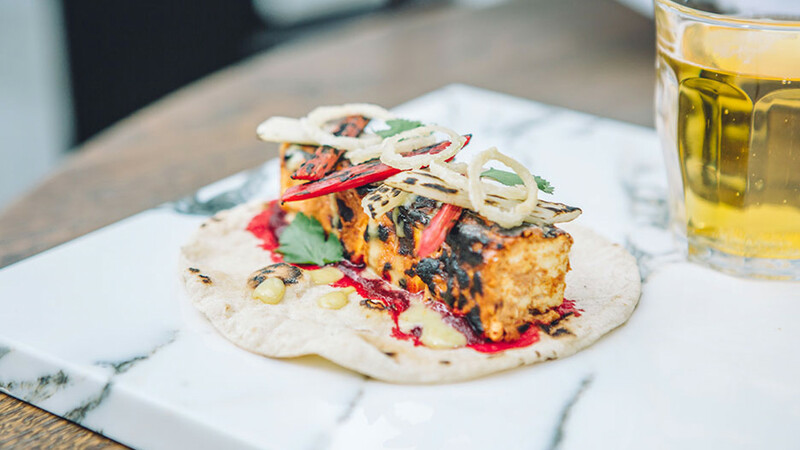 To really break down preconceptions about the "kebab", and to make the food we wanted to make, we needed a proper kitchen and all the extra scope that brings. Each one of the kebabs has five or so elements made from scratch and the prep really necessitates a full kitchen. We work mainly with UK-only, organic suppliers. But it's always changing. As for butchers, we buy meat from different butchers, we're looking for specific breeds, specific fat content within those breeds. There's a farm in Sussex called Dingley Dell – its pork is organic, it's free-range and it's specially bred for its fat content. Chicken is free-range, corn-fed Norfolk Black, and our venison is wild, shot in Yorkshire and hung for a particularly long time. We're always looking for new things. I'm having a dairy cow put out to pasture. It won't be on the menu for at least three months though, as you've got to retire these cows for a while to tender the meat, they have to stop being milked for a while and just graze. It's an experiment because this farmer has never has never done this before. You can use pretty much anything from a cow to make a kebab. One of the things we do here, we try to be very root-to-stem and very nose-to-tail. One of the awesome things about having these guys in the kitchen, they're very technical chefs. 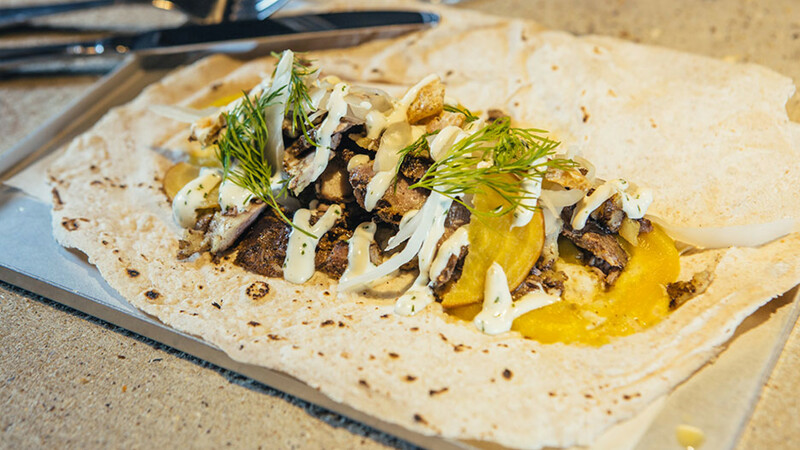 For example, our pork shawarma is made out of pork shoulder, which needs a long slow cook. You can't give something a long slow cook on a grill, it doesn't work, unless you do it rotisserie, so we water bath it for about 23 hours at 63 degrees and then finish it on the grill. So we can use pretty much anything. From a cow, we could use the shin, we can put that into a testi kebab. I like braising it down in a spicy stock, or using a ribeye and get it straight onto the barbecue. We can use anything. That's the beauty of a kebab – it permits all sorts of things. The wines start at £19, so we're not talking expensive wine, but good wines. I think there's this whole irreverent thing about pairing accessible foods with 'fine' wines. The thing that kicked it off was Bubbledogs – why not drink champagne with a hot dog? Why should I only have champagne if I'm sat down at a Michelin-starred restaurant? There's no reason why people shouldn't drink awesome wine with a dish that's inexpensive and relatively rustic, and I think a lot of people do that at home on a Friday night. They might crack open a ready meal and a really great bottle of claret. Our project with wine is really, really value-driven, for one thing. It's about this accessibility thing. I just hate that you have to spend loads of money in a restaurant in order to actually enjoy a bottle of wine. We view the restaurant as a vehicle to educate people about new, interesting wines. We've got some from the Czech republic, we've got some from Croatia and from lesser-known parts of Portugal and Italy. We're trying to do cool and interesting things. We are also lining up some really fine wines which we're going to put on there at a very reasonable price, just because there's this thing about bringing kebabs up in this estimation. It's a dish you can consume with an awesome bottle of wine, why not? Why only kebabs and beer? Wine is something that Ed and I are both really passionate about. People are very welcome to have a beer with their kebab here, they're very welcome to have a cocktail, whatever they want, but there's definitely a place for great wines in this restaurant. Do you have a favourite kebab and wine pairing? There's a really, really amazing wine on our menu called the 2010 Meerlust Rubicon from Stellenbosch [in South Africa] – it's a really chewy, smoky, fruity, plummy, beautiful wine, and with the roe deer adana it's just a match made in heaven. It's a smoky kebab, it's big, it's red meat and it can take the hefty tannin structure of the wine. If I were going to sit down and have anything, that would be it. It's such a good combo. When did you become so interested in food? I've been cooking ever since I was tiny. I'm a good domestic cook but I couldn't cook a service. It's a very, very different skill. It's weird because I love nothing more than food. Since I was younger than I can remember, I've been getting stuck in in the kitchen. My parents tell me when I was really tiny I used to love it. When I'd be crying they'd get me in the kitchen and get me to knead some dough as it would calm me down. So I've been cooking all my life and the amount I think about food is genuinely weird. Sometimes I reflect on it and think I need to care more about other things as it's probably unhealthy! I always muck in in the kitchen and help if they need it and I'm very hands-on when it comes to the development of the food. There are dishes from everyone on the menu but I wouldn't want to be that side of the pass. It blows my mind, the idea of being able to serve 50 kebabs in one evening, plating those things up and doing it simultaneously. It's such a process which I can't even get my head around and I wouldn't be very good at it. Cooking for six people at home, absolutely love it, it's my favourite thing to do, but actually in the kitchen, I know I wouldn't be very good. I'd be really slow! And I'm very messy as well, which isn't something that goes down well in professional kitchens. I leave a trail of destruction behind me. What do you like most and least about the London food scene? What I like most is the way that there's been this incredible specialisation of restaurants recently. Everyone now seems to be homing in on one thing, whether it's kebabs, or pizza. These places are better value because the institution is focused on one thing. I think if we tried to branch out and be a Middle Eastern restaurant, our kebabs wouldn't be as good. Because all we think about, pretty much, is kebabs. I think what's been so wrong about so many restaurant menus over the years is people trying to do everything. I also think that people essentially make their food-genre choice before they go to the restaurant, whether they want to have a burger or barbecue. The thing I like least is the price of wine. By and large, it's way too expensive to get a nice bottle of wine in London. If you want to spend £20, if you took that money to Waitrose, you'd get a really delicious bottle of wine, but in most restaurants, it will get you something that you just don't want to drink. I find myself not ordering wine, because I open a wine list and think, where's something I'm interested in and sounds like it's going to be good? And usually that starts at about £30 and that's just a lot of money, particularly when you're skint. Unless a restaurant has a really unique business model, they're always going to have to charge a premium for wine. It's just an inevitability. A retailer has a shelf full of stuff and they're selling way more of it, whereas at a restaurant, you've got to pay for the waiter and the space and it's completely legitimate. But I think in places with a higher volume of customers going through them, more casual restaurants don't have to make so much money out of each bottle. At Michelin-starred restaurants, their overheads are so huge they do have to make more money on their wine. It's also the procurement. If you really curate your wine list and you're fastidious about finding great value stuff, that can translate into good value. And that's your duty as a restaurant. 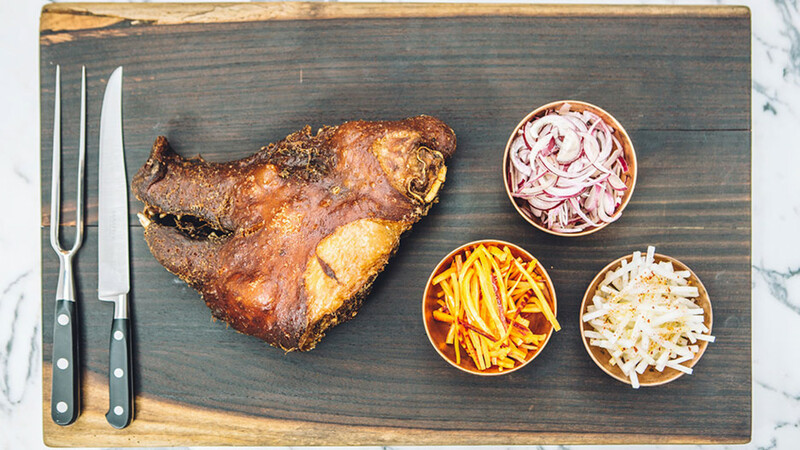 I have this thing about Pitt Cue Co – I love everything they're about, I love that they've appropriated the genre of American barbecue. What they do is not American barbecue and it would be wrong to assume that. They've taken the inspiration from American barbecue , but they have elevated it in so many ways. The principle way is just getting this astonishing quality of meat. I went on a barbecue pilgrimage around the south east of the US back when I had some money and we went all around Carolina, Georgia, Louisiana, Texas, and I don't think I ate any barbecue there that was better than Pitt Cue's. I just love it. I also love Tuscanic, a Tuscan deli on Old Compton Street. It's quite hard to spot, you could easily walk past it. Everything in there comes from Tuscany and they do incredibly reasonably priced paninis. Panini has become such a dirty word because of its association with high-street coffee shops, but these are just gorgeous Italian sandwiches with these sumptuous Tuscan ingredients inside. That's where I always go for a casual lunch or afternoonsies. What's next for the kebab? I'd like to see the kebab go the same way the burger has gone. I think people doing kebabs, whether it's Black Axe Mangal or Souvlaki or it's a really good Turkish place in Dalston, have to do more to overturn preconceptions about kebabs that anyone has ever had to do for burgers or hot dogs. When you say kebab, the thing that springs to mind still is that rotating, sweaty, processed doner. Kebabs have sunk lower than burgers ever did. That said, I think kebabs are such a fundamentally delicious thing – and they're quite a balanced meal as well – I see no reason why they can't be a casual staple like the burger. Now, a good-quality burger is something that our mums would go and eat. George Osbourne goes to Byron; no one turns their nose up at a burger these days. There's been a popularisation of burgers with proper, good-quality meat, treated with a bit of respect and they're now as acceptable as a bowl of pasta. And I'd love to see kebabs go that way. Top Floor, Kingly Court, Carnaby St, W1B 5PW; eatlebab.com. Read our verdict on posh kebabs.